The Mayor personally represents the City, supervises the work of the Board and the City Hall, and generally manages the City. Mayor Lassota is a mechanical engineer by profession, having graduated from the Mechanical Faculty at the Technical University in Cracow, before completing his post-graduate studies in refrigerating engineering at the Łód Technical University. He began his professional career as senior constructor at the Production Plant of Transport Equipment in Mielec. Later he moved to Cracow, where in 1990 he became the Director of Cracow Voivodship Office, and a year later the Cracow Voivode. Over the years he has been actively involved in politics. In 1980 he was among the founders of the Inter-Enterprise Initiating Committee of the Solidarnoć Trade Union in Cracow. In 1981, when martial law was introduced, he was interned. By the end of the 1980s he was actively involved in clandestine work of the Małopolska Regional Board of Solidarnoć. 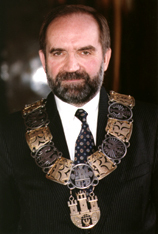 In 1992, in the middle of the term of the first local government (reintroduced in Poland after 1989), he was elected the Mayor of Cracow. In the 1994 local elections Józef Lassota was one of the leaders of the Cracow Coalition "Twoje Miasto", which won the largest number of seats in the City Council. The new Council re-elected Józef Lassota the Mayor of Cracow. Taking up his post, he declared that his mission as a mayor will be to improve the quality of life for the residents of Cracow and to promote the development of the city in order to restore its prestigious reputation as a recognised international centre of culture, art and science and a modern centre for tourism and business. In addition, Mayor Lassota is Vice-Chairman of the Board of the Union of Polish Metropolises and a member of the Board of the Association of Polish Cities. He is also the Chairman of the "Zakopane 2006" Association of Municipalities for Winter Olympics. In 1997, he was elected an MP to the Sejm (Polish Parliament), running for this office on the list of Unia Wolnoci (Union of Freedom), a party he joined in 1996. He is a member of the parliamentary Local Government and Regional Policies Committee.